Donald Rumsfeld was born in 1932 in Chicago, Illinois, attended Princeton University on scholarship, served in the U.S. Navy (1954-57) as an aviator, and was All Navy Wrestling Champion. Married in 1954, he and his wife Joyce have three children and five grandchildren. Mr. Rumsfeld is in private business and is Chairman of the Board of Directors of Gilead Sciences, Inc. He serves as a member of the boards of directors of ABB (Asea Brown Boveri) Ltd. (Zurich, Switzerland), Amylin Pharmaceuticals, and Tribune Company. He is also Chairman of the Salomon Smith Barney International Advisory Board and an advisor to a number of companies, including Investor AB of Sweden. He is currently Chairman of the U.S. Commission to Assess National Security Space Management and Organization. In 1962, at the age of 30, he was elected to his first of four terms in the U.S. Congress. In 1969, he resigned from Congress to join the President's Cabinet. He served as Director of the Office of Economic Opportunity and Assistant to the President, and later as Director of the Economic Stabilization Program and Counselor to the President. In January 1973 he was posted to Brussels, Belgium, as U.S. Ambassador to North Atlantic Treaty Organization (NATO). In August 1974, Mr. Rumsfeld was called back to Washington, D.C., to serve as Chairman of the transition to the Presidency of Gerald R. Ford. He served as Chief of Staff of the White House and as a member of the President's Cabinet, 1974-75, and as the 13th U.S. Secretary of Defense, 1975-77, the youngest in history. In 1977, Mr. Rumsfeld left Washington, D.C., after some twenty years of public service and lectured at Princeton University's Woodrow Wilson School of International Affairs and at Northwestern University's Kellogg Graduate School of Management prior to entering business. In June 1977, he became Chief Executive Officer of G. D. Searle & Co., a worldwide pharmaceutical company, where he served until 1985. The turnaround there earned him awards as the Outstanding Chief Executive Officer in the Pharmaceutical Industry in 1980 and 1981. He was in private business from 1985 to 1990. 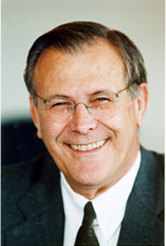 From 1990 to 1993, Mr. Rumsfeld served as Chairman and Chief Executive Officer of General Instrument Corporation, a leader in broadband and digital high-definition television technology. After taking the company public, Mr. Rumsfeld returned to private business. During his years in business, he has continued public service in a variety of federal posts including service as President Reagan's Special Envoy for the Middle East, and as a Member of the President's General Advisory Committee on Arms Control, and the National Economic Commission. His current civic activities include service on the Boards of Trustees of the Chicago Historical Society, Eisenhower Exchange Fellowships, the Hoover Institution at Stanford University, the Rand Corporation and the National Park Foundation. He is also a member of the U.S.-Russia Business Forum, and recently completed service as Chairman of the U.S. Government Commission to Assess the Ballistic Missile Threat to the United States. Honors include: Distinguished Eagle Scout Award (1975), George Catlett Marshall Award (1984), Woodrow Wilson Award (1985), Dwight Eisenhower Medal (1993), and eleven honorary degrees. In 1977, Mr. Rumsfeld was awarded the nation's highest civilian award, the Presidential Medal of Freedom.